We’d love your help. 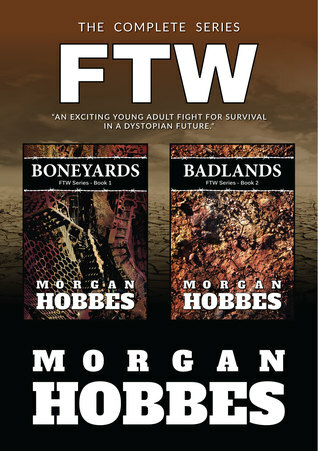 Let us know what’s wrong with this preview of Boneyards & Badlands by Morgan Hobbes. Echo Fox lives in a boneyard, a brutal existence where your life can be cut short in a heartbeat. Everything beyond the walls including the air you breathe is controlled by one company: FTW. When her friend Kara is murdered by outsiders, Echo vows revenge on the people who took it. Leaving the only life she knows behind her, Echo goes from the lowest place on Earth to wher Echo Fox lives in a boneyard, a brutal existence where your life can be cut short in a heartbeat. Everything beyond the walls including the air you breathe is controlled by one company: FTW. When her friend Kara is murdered by outsiders, Echo vows revenge on the people who took it. Leaving the only life she knows behind her, Echo goes from the lowest place on Earth to where nothing is beyond her reach. In this world beyond her imagination, what she finds could mean the end of her life as well. To ask other readers questions about Boneyards & Badlands, please sign up. On this planet lives a man named Morgan Hobbes. He's not the only person living there; in point of fact there are billions of people, and most of Far out in the uncharted backwaters of the unfashionable end of the western spiral arm of the Galaxy lies a small unregarded yellow sun. Orbiting this at a distance of roughly ninety-two million miles is an utterly insignificant little blue green planet. On this planet lives a man named Morgan Hobbes. He's not the only person living there; in point of fact there are billions of people, and most of them wouldn’t know who Morgan Hobbes was even if he threw a rock at them. Not that he makes a habit of throwing rocks at people. Morgan lives in Newcastle, Australia with his wife and children. His day job is in tech support and training though he'd much prefer to be writing fiction. He's a fan of science fiction and fantasy, preferably stories leaning towards humorous, but will read anything that takes his fancy.